Why Use a Remote Control on a Ceiling Fan? 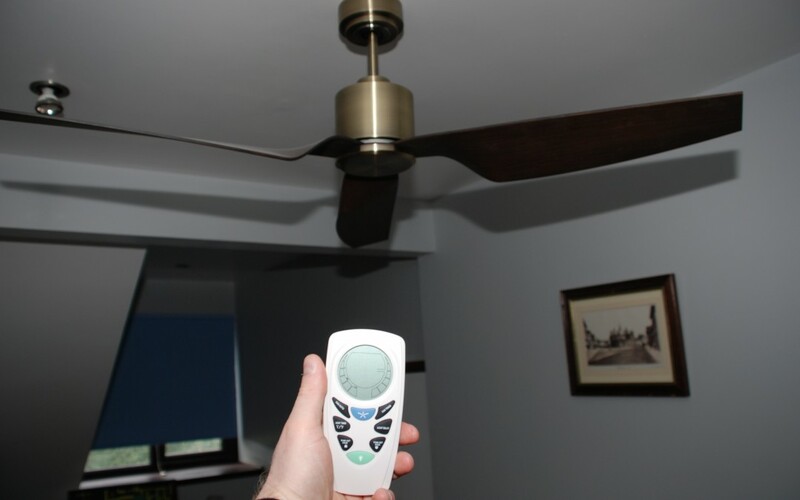 Virtually all of our ceiling fans work with a remote control including the speed setting, light on/off and reverse. The remotes are available to order separately with a choice of Hunter or other good brands, most of which will work with Hunter. There are one of two cheaper models which just use a pull-chain to operate them or else come with a wall control. The control system comprises of the hand held remote or transmitter and the receiver. The receiver usually sits in the canopy of the fan out of sight although on some designs the receiver is attached to the downrod giving more of a space-age look! The receiver and transmitter work either by infrared or by radio frequency RF. If it is by RF (which most of them are) then they must be set to the same channel to operate. This is done by pairing the dip-switches. As many home devices tend to use the same RF channels occasionally these can interfere with the fan remote and so for example a music center remote could start your ceiling fan if the fan was in your lounge! One of the big benefits of using a remote control for your fan is if you wish to use a light kit on your ceiling fan then it avoids having to run a 4th wire from your wall switch to the fan which you would otherwise need to turn it on and off independently of the fan itself. This 4th wire is what enables the light to be turned on and off from the wall. You can also control more than one fan at once by one remote and so could arrange – by setting the dip switches on the receivers and matching them with the setting in the remote – for banks of fans to be controlled by each remote, which is useful if you have a lot of ceiling fans to control. The downside of using remotes is that if you don’t have a wall cradle or safe place for them they can “disappear” leaving the fan to be controlled either by the mains power or by the pull chain. A remote control also does mean one more thing to go wrong but we think that the benefits far outweigh the negatives and most of our customers buy them.